Earlier this year, a relatively rare 270 year old book was been found in the vaults of an American library society in Southern Carolina, USA. The 1743 book about political parties is entitled 'Dissertation Upon Parties' and was written by Henry St. John Lord Bolingbroke. The book is was one of 800 volumes, that the diplomat John Mackenzie donated to the College of Charleston in the 1700s and has his name embossed on it. Around 15 copies of the original Bolingbroke book are thought to have survived in mainly academic libraries around the world. 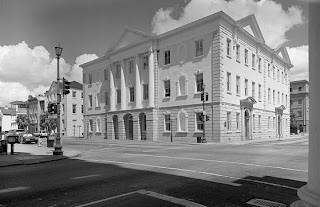 Mackenzie's library was temporarily housed at the Charleston Library Society until a library was built at the college. In 1778, a fire destroyed much of the society's collection and only 77 titles from the Mackenzie collection were thought to have survived. The book was found during a long term project to catalogue the Charleston Library Society holdings. It has been returned after all this time to the college. Find out more about this story. Auckland Libraries holds a number of political works by Bolingbroke in its heritage collections. Find out more about these holdings.